Odontomas are the malformation of the dental tissues constituting for 22% of all the odontogenic tumors. Odontomas are benign, nonaggressive, sometimes interfering with the eruption of the associated tooth, leading to impaction or delayed eruption. They are usually painless with neuralgic symptoms presenting only on compression of nerves which is rare. Due to its limited growth potential, odontoma rarely shows their evidence, unless it is secondarily infected or causes complications such as displacement/uneruption of associated tooth, swelling, pus discharge, and esthetic problems which can be avoided on early diagnosis. 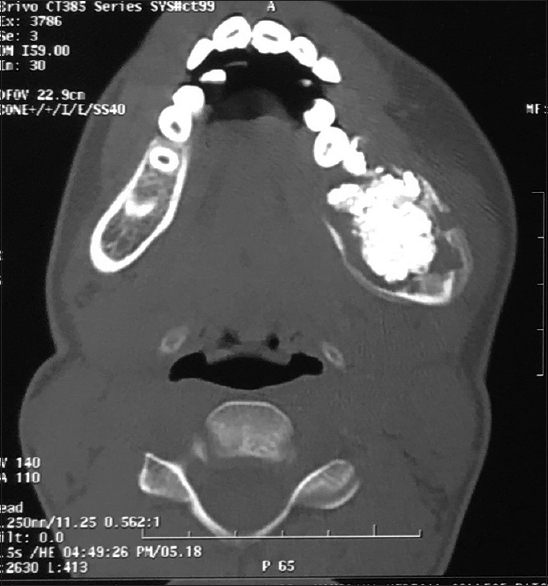 The purpose of this article is to highlight on the notable presentation of complex odontoma with large swelling and abscess drainage in a very young patient. Odontomas are the developmental anomaly of the dental tissues constituting for 22% of all the odontogenic tumors. It is considered as hamartomatous malformation rather than true neoplasm. Although the frequency of odontomas varies in different population groups, in India, various authors in their retrospective studies reported an incidence of 5.3–11.6%,,. The exact cause for the development of odontomas is not clear in the literature. At present, odontoma is restricted to tumors consisting of dental hard tissues, i.e., compound, complex and compound-complex mixed lesions. Compound odontoma is composed of well-organized dental tissues known as denticles, whereas in complex odontomas, they are haphazardly arranged. The incidence of compound odontoma is 9–37% and that of the complex odontoma is 3–50%. There is no gender predilection and is most common in the second decade of life. Nearly 57% of the lesions are identified during routine radiographic investigations, and a very few reports with swelling, pain, delayed eruption, lymphadenopathy, or rarely exposed hard mass, i.e., erupted odontoma are available. The purpose of this paper is to highlight on the notable presentation of complex odontoma with large swelling and abscess drainage in a very young patient. A 12-year-old girl reported to the Department of Oral Medicine and Radiology, Navodaya Dental College and Hospital, Raichur, Karnataka, India, with the chief complaint of pain since 3 months and swelling since 1 month in the left side of the lower jaw which was associated with pus discharge since 1 week. 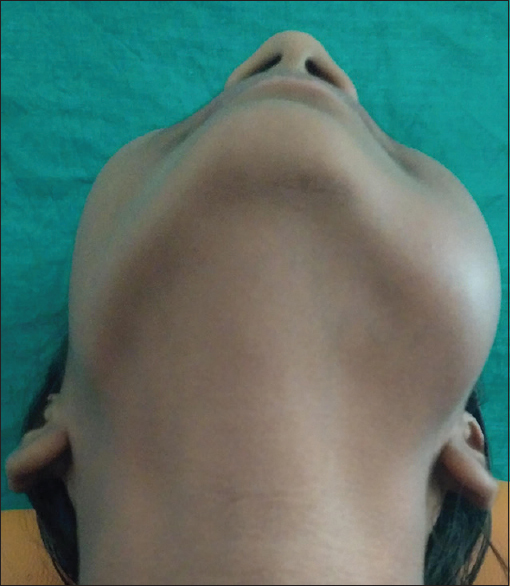 On extraoral examination, a diffuse, hard, and tender swelling over the body of mandible on the left side extending up to left submandibular space with inflamed overlying skin was present, measuring 8.3 cm × 5.8 cm [Figure 1]. The local temperature was raised; ipsilateral submandibular lymph nodes were palpable, movable, and tender which were firm in consistency. Intraorally, swelling was present on the left side of the mandibular alveolar ridge with vestibular obliteration and missing 36 and 37 teeth and inflamed overlying mucosa [Figure 2]. Pus discharge was seen through multiple sinus openings over the gingiva. 35 tooth was rotated. On account of clinical findings of missing molars in a 12-year-old girl associated with moderate swelling and pus discharge, a diagnosis of inflammatory swelling secondary to pericoronal inflammation was suspected with a differential diagnosis of an infected odontogenic cyst associated with unerupted/impacted molars. Orthopantomograph showed a dense radiopaque mass, surrounded by a radiolucent band in the region of 36 tooth, with its mesial and inferior displacement. 37 tooth was missing radiographically. Downward displacement of mandibular canal toward inferior border of mandible was noticed [Figure 3]. Computed tomography (CT) scan was advised to determine the extension, expansion, thinning, and perforation of the lesion, which showed well-defined densely calcified lesion measuring 3 cm × 3.5 cm with surrounding radiolucent halo in the left side of the posterior part of mandible with buccal and lingual cortical expansion and areas of cortical breach at places with medially displaced unerupted 36 tooth [Figure 4]. The radiographic investigations confirmed the lesion as complex odontoma. 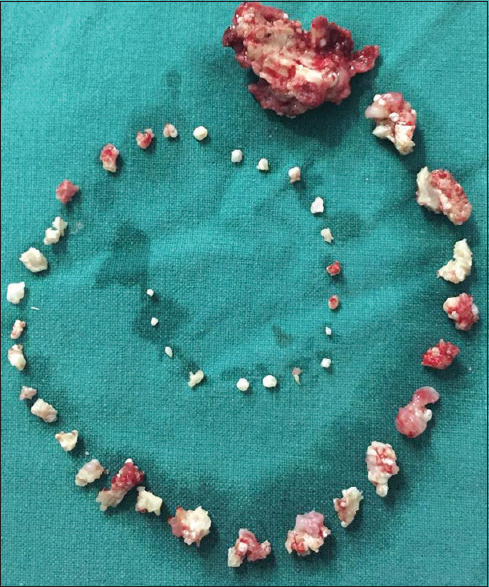 Conservative surgery with retention of 36 tooth [Figure 5] was performed under general anesthesia with complete removal of the mass as discrete multiple calcified structures [Figure 6]. Histopathological examination confirmed the diagnosis of complex odontoma. The incidence of odontogenic tumors is 0.002–0.1% among which odontomas are the most common noncystic odontogenic lesions. Complex odontomas constitute 5–30% of all odontogenic tumors of jaw and less common than compound odontoma by onefold. Kraugers et. al. analyzed 351 odontomas of the jaws and found that the average age of compound odontoma was 16.5 years and that of complex odontoma was 22 years. In the present case, the patient was young 12-year-old girl coinciding with the age of second molar eruption. The complex odontoma is usually located in the posterior part of mandible as in our case, whereas compound odontoma is mostly seen in the anterior maxilla between roots of erupted teeth or over the crown of impacted teeth. Odontomas usually remain small, seldom exceeding the diameter of the tooth. They can vary greatly from a small mass of little more than few millimeters up to the largest known case in human being that of one weighing 11 ounces, resting in the museum of Guys Hospital, London. This fact illustrates that odontomas rarely result in any complications. However, in the present case, a large odontoma is seen measuring 3.3 cm × 3.5 cm with intraoral discharge and lymphadenopathy. Radiographically, complex odontoma appears as a radio-opaque mass which does not resemble tooth structure, surrounded by a narrow radiolucent band corresponding to the capsule and a smooth outer radiopaque periphery, whereas in the present case, expansion, thinning, and perforation of cortical plates were seen which is a rare phenomenon. Infection of odontomas can also lead to pathological fracture of the jaws and osteomyelitis followed by extraoral eruption of the mass penetrating the cheek. Due to its limited growth potential odontoma rarely shows their evidence, unless it is secondarily infected or cause complications such as displacement/uneruption of associated tooth, swelling, pus discharge, and esthetic problems which can be avoided by prompt and early diagnosis. 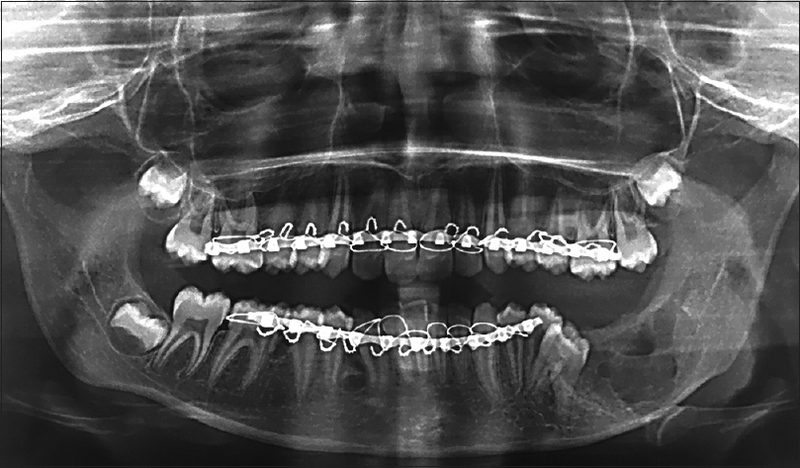 The present case highlights that odontomas could occur even in a very young age of 12 years presenting clinically as an inflammatory swelling unearthed with radiographic investigations. Due to its benign nature, odontomas can be treated by the conventional surgical removal followed by preservation of the unerupted tooth for further eruption. Yeung KH, Cheung RC, Tsang MM. 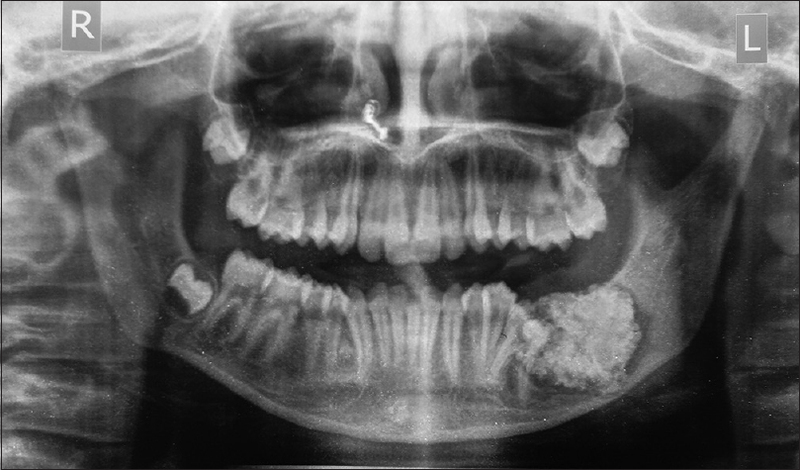 Compound odontoma associated with an unerupted and dilacerated maxillary primary central incisor in a young patient. Int J Paediatr Dent 2003;13(3):208-12. Sriram G, Shetty RP. Odontogenic tumors: a study of 250 cases in an Indian teaching hospital. Oral Surg Oral Med Oral Pathol Oral Radiol Endod 2008;105(6):e14-21. Varkhede A, Tupkari JV, Sardar M. Odontogenic tumors: a study of 120 cases in an Indian teaching hospital. Med Oral Patol Oral Cir Bucal 2011;16(7):e895-9. Gill S, Chawda J, Jani D. Odontogenic tumors in Western India (Gujarat): analysis of 209 cases. J Clin Exp Dent 2011;3(2):e78-83. Philipsen HP, Reichart PA, Praetorius F. Mixed odontogenic tumours and odontomas. Considerations on interrelationship. Review of the literature and presentation of 134 new cases of odontomas. Oral Oncol 1997;33(2):86-99. Hidalgo-Sánchez O, Leco-Berrocal MI, Martínez-González JM. Metaanalysis of the epidemiology and clinical manifestations of odontomas. Med Oral Patol Oral Cir Bucal 2008;13(11):E730-4. Kraugers GE, Miller ME, Abbey LM. Odontomas. Oral Surg Oral Med Oral Pathol 1989;67(2):172-1. Satish V, Prabhadevi MC, Sharma R. Odontome: a brief overview. Int J Clin Pediatr Dent 2011;4(3):177-85. Worth HM. Principles and practice of oral radiologic interpretation. Chicago: Year Book Medical Publishers Inc.; 1963. p. 422.